The Smoking Gun offers an alternative to traditional smoking methods; There are virtually no other methods that allow you to make such big flavor and aroma differences so easily. Simply fill the Smoking Gun chamber with your choice of combustible, turn it on, light with a match or lighter and apply cool smoke where you'd like it. Includes: The Smoking Gun, acrylic stand, 18-inch nozzle extender hose, four AA batteries and two.5-ounce wood chip samples of both Applewood and Hickory smoking chips. Works on various types of wood chips, teas, herbs, spices and even hay and dried flowers. The durable, hand-held Smoking Gun operates on just four AA batteries allowing you to experiment and create signature culinary creations at extremely low cost per serving. 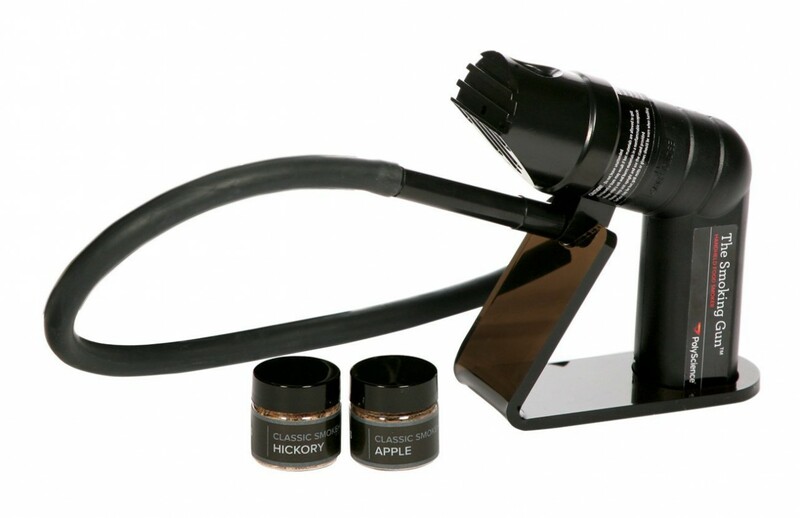 Click the button below to add the The Smoking Gun Handheld Food Smoker to your wish list.